So we've made it to the end of Coco's advent-thank you so much for reading each post and peeping behind each door into a world of fashion and festive delights! I'm so proud to have managed to post every day of advent for you, particularly in what has been a super challenging and hectic work month! I love to write and chat fashion, so thank you for continuing to read and follow my fashion adventures and ramblings, you honestly don't know how grateful I am! Today is not only Christmas Day, but it's also my 32nd birthday, so whilst I'll probably still be snoozing when this post goes live, it's going to be a day of presents and Prosecco for me, as I celebrate at home with my Mister. I want to take this opportunity to wish all of you a wonderful Christmas filled with everything you've wished for! And for those of you that don't celebrate, I hope you all have a wonderful day all the same (feel free to celebrate my birthday if you wish, I don't mind sharing!). 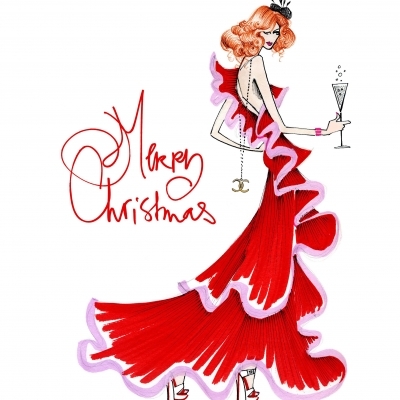 Although I love luxury fashion and the prettier things in life, I think Christmas is a time where the most important things are your health, your beautiful friends and family and lots and lots of happiness for everyone and with that said, I want to send you all some love, from the bottom of my heart!